We have been learning about God and Values. Hi! This is Chester and he is from Room 2. After mass today, the room 2 students went to Room 8 and we coloured in doves and we cut them out. All we have to do now is put them up in our classroom! About a month ago I was walking back to my house from the Panmure Library at 4:45pm. Then when I got to my street I heard a bark and when I looked back I saw a big brown pit bull. It was probably the size of a “34” inch TV. I sprinted as fast as I could around cars, behind trees and on the road. Fortunately for me, the owner heard the dog barking and recognised that something was not right and came out of the house and called the pit bull in. The relief I felt at that moment when I realised that it was not longer heading for me, was unbelievable! Not surprisingly the speed that I was moving slowed and I started to walk again. My mind and body were not over the shock, I was in colossal shock, my heart was pounding like a V6 engine. When I got home I told my mum and dad about it. I have heard reports about people, mostly children, some even younger that me, being attacked by this type of dog and after this experience, I think that every pit bull in the world must be professionally trained because they can be very vicious animals. Learning Intention: I am learning to plan my ideas before writing and to add detail to my main ideas. I had a blast with my cousin AJ in the holidays. My favourite part was going to Mega-zone to go play a game of bumper cars and laser tag. Our first plan was to go to the movies to watch fast and furious 7, but instead my cousin AJ wanted to go play some laser tag. We were both in the red team. There were three teams of two, red, blue and green. Our strategy was, I stay upstairs to protect our base and he goes out to all the other bases to get us some points.The time we finished the game, we hooked up our gear on to the hooks and we both ran back to the counter to see our score on the T.V. On my way to the counter I had a feeling we would win. “Yes we won” !!! said my cousin. We won the game about 4000 points in front of the team that was in second place. After our victory, It was time for our of bumper cars. The staff member opened the gates for us to choose a car, I picked the purple car because I like purple. While I was driving, I had a feeling that I could be a driver in ‘Fast & Furious’, unfortunately I'm not. I turned left, right, forward, backwards and even diagonally. I could barely control my vehicle. My driving ability was made difficult by the other drivers who continue to crash in to me. At times I was terrified for my safety and that I might actually fall out of my car. It was more intense than I thought. We finally finished our game, I was desperate to play another. We walked home after we had a feed at Sylvia Park. It was a great time at Mega zone with my cousin. If you get a chance to go I'm sure you will enjoy it. Today we used Padlet to show our thinking about a recent news article as we read. Asking questions showed that we were engaged and thinking / making meaning of what we were reading. Labels: Padlet: Response Decicration of Graves. then I made a dove and then I took a photo of it thank's to my Buddy Blogger partner - Filipo. Labels: Learn Create and Share with our Buddy Bloggers at Pentecost. In room 8 we have Buddy Bloggers and they visited us today after Church, where we went as a school to celebrate the Feast of Pentecost, which reminds us of how Jesus sent the Holy Spirit. Today my buddy and I made Dove's to represent the Holy Spirit. We made this because today was the Feast of Pentecost (50 days after Jesus ascended up into Heaven). I had a blast with my little buddy and he had a lot of fun as well as we went through the process of 'Learn, Create and Share'. This week, our buddy bloggers visited. It is always fun to Learn, Create and Share. This is my buddy blogger Lolenese. Hi my name is Lolenese, and I'm 5 years old my and I like to eat strawberries. My teachers name it Sister Evalesi. She always helps me in my school work and she is so kind to me she always wants me to be the top in my class, and she always gives me sticker. She is the best teacher in the whole world. Labels: Buddy Blogging - Learn Create and Share. Buddy Blogging is always fun, it allows us to Learn, Create and Share same time as we work with our 'Buddies'. |\colors to color on her dove. This was Elma's finishing touch. He was good at shooting with snipers and other guns. He told his brother not to go in war. Archibald Baxter a good Gunman and Combat Boxer.Archibald didn’t want to go to war and was punished for not participating in the war.He was punished by being tied to a pole for four long hours.While he was tied to a pole shells fell on him he was hurt real bad and had to go to the hospital..He was then put in a dark box and only saw light when he was given food.Then he told his brothers not to go to war. He was now known as a 'Conscientious Objector'.After the war Archibald got married and had two children but went to hospital two days a week for mental issues. Labels: Cnscientious Objector - Archibald Baxter. Reading to Learn. Have you ever had to sit in the hot sun with no hat what-so-ever? 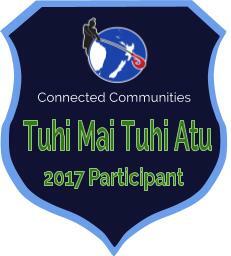 Well, Wednesday 25th March the 12 Manaiakalani Schools including: Tamaki Primary, St Pius X, Glenbrae School, Tamaki College, Panmure Bridge, Stonefields, Glen Innes, St Patricks, Sommerville Special School, Ruapotaka Primary and Te Kura Kaupapa Maori O Puau Te Moananui A Kiwa gathered at Pt England beach to greet the Hokule'a & Hikianalia Education Leadership coming all the way from Hawaii. As the whole school walked to our designated seating place, we saw our classmates:Natalia, Giovanni and Johnnie. These student were chosen as leaders to represent our school along with other leaders from the Manaiakalani Cluster, to lead the Haka and Waiata that had been taught by one of the Maori teachers in Pt England over the previous few weeks. The whole cluster was talking until the sound of a horn filled the air and caught the attention of the adults and children waiting patiently. Everyone’s eyes stared out to the water of the Tamaki River to see looked the huge Waka slicing through the shining water towards the 2000 strong crowd. It was so quiet at that time that heard the anchor drop into the water to bring the waka to a stop. At that same moment, a woman stepped up on the sandy foreshore before us and began a karanga, calling to the visitors and the ancestors. When the woman finished her karanga, a mini speed-boat glided to shore, bringing groups of our guest’s to shore. The leaders started off perfectly singing “E Oho” and doing the Haka that goes with it. Everytime the speed-boat came the leaders would sing until every single person in the Waka had come. When each guest had left the Waka a man did a karakia and we our guest’s replied to his speech with speeches in their language. Our guest’s sang a Hawaiian Song and 3 students from Pt England school, said their Maori Mihi’s, followed by a koreo (short talk) about why the Manaiakalani Schools were there and how the word “Manaiakalani” had been formed. After the Mihi’s were finished the Principal from Pt England, Mr Burt had a little hug with one of the guest’s and told the whole Cluster that it was time for ... ‘The Impossible’ This is where each school (starting with Pt England) got up and walked down onto the sand to personally be part of the welcome by doing high-fives! When St Patrick’s had finished high-fiving each guest we walked to our bus and left to school. It was a great experience to see people part of our Manaiakalani Cluster coming to see how each school in the cluster is working with their Chromebooks. 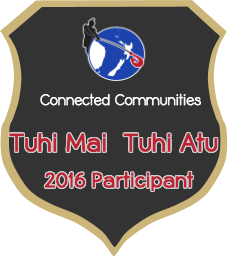 The student leaders were invited back to Pt England school to the Hangi that people from the Marae ( A Carved Building that usually belongs to the local iwi) What a fantastic experience, definitely one to remember.